There are almost as many works about intellectuals as there are intellectuals. Perhaps this is because intellectuals are masters of the word and their mastery is often used to write about themselves. Indeed, with the possible exceptions of sports figures and film actors, intellectuals may be the most overpublicized people in America. In this classic study, originally published in 1974, Charles Kadushin examines the attitudes of that class of people known as the American intellectual elite. While most works on intellectuals first establish who should be included under the title "intellectual," and debate their characteristics, Kadushin instead sets forth a sociological history of leading American intellectuals of the late 1960s. The book's concern, however, is primarily with time and place. While The American Intellectual Elite is very much about social circles and the networked "small world" of intellectuals defined by the institutions such as the journals and magazines around which they gathered, the uniqueness of this volume is the recognition that fact must come before theory. Thus, the collective attitude of leading intellectuals of the sixties are presented in a straightforward and dispassionate manner on topics as diverse as the Vietnam War, race relations, foreign and domestic policy, and the place of intellectuals in the resolution of such issues. Now in paperback with a new introduction by the author, The American Intellectual Elite is an influential work that will be valued by students of sociology, members of the intellectual elite, and professionals and students of contemporary American history. 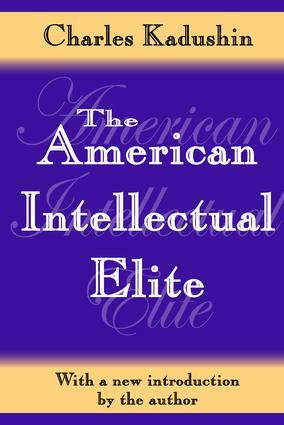 Who Are the Elite American Intellectuals?